If EastEnders and Coronation Street thought they had the monopoly on dramatic weddings, they should think again. 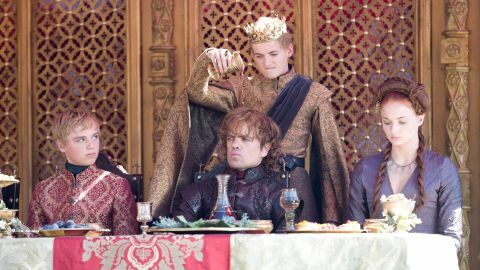 After the bloodbath of last year's "Red Wedding" , this year's Purple Wedding proves just as eventful, ending as it does with the groom, King Joffrey, having a rather nasty (and fatal) reaction to some rather potent poison. George RR Martin wrote the script himself, and he clearly enjoys constructing one of A Song Of Ice And Fire 's most pivotal moments in a new form. It's a cracker of an episode, loaded with brilliant character beats and one of the great TV twists – if you haven't read the books, Joffrey's death must have come as one hell of a surprise. Taking up half of the episode, the wedding itself is magnificent.There's bitchiness aplenty (mostly from queen of mean Cersei), one-upmanship (after last week's debut, the Red Viper continues to own every scene he's in), and of course, that death scene. It's a particularly bad week for Tyrion, even before he finds himself accused of killing Joffrey. With Varys having convinced him that Shae will die if she doesn't leave King's Landing, it's heartbreaking to watch him pretending that he doesn't want her anymore – his cracking voice betrays the truth, and fact that King's Landing has once again punished one of the good guys. But as satisfying as it is to see Joffrey get his just desserts, you can't help feeling there'll be an unfillable gap in the show without its most boo-hiss villain. Iwan Rheon's Ramsay Snow does his best to out-nasty the outgoing king, but he's a little bit too pantomime to be entirely believable. Even his father, Robb-slayer Roose Bolton, struggles to take Ramsay seriously after learning what he's done to Theon – it's with some reluctance that he dispatches his lad to take Moat Cailin and prove his worth to the family. Speaking of Theon, it was going to take something big to make us sympathise for the young Greyjoy after the way he betrayed the Starks, but Ramsay has made it possible. Theon's a broken man now, the way he gently shaves his captor's face and tells the truth about Bran and Rickon suggesting that the fight really has been beaten out of him. Elsewhere, events unsurprisingly play second fiddle to the wedding, but Jaime sparring with Bronn is a lot of fun, Bran (who appears to be ageing at an artificially accelerated rate) is having weirder and weirder visions, and the perennially miserable Stannis (under the influence of Melisandre and his bonkers wife) is burning anyone who refuses to embrace his fire god. Not even his brother-in-law is spared the Guy Fawkes treatment, but it's the sort of craziness that might just make him an ideal fit for the Iron Throne.